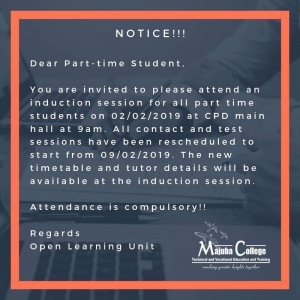 You are invited to please attend an induction session for all part time students on 02/02/2019 at CPD main hall at 9am. All contact and test sessions have been rescheduled to start from 09/01/2019. The new timetable and tutor details will be available at the induction session. Regards – Open Learning Unit.